Warrington Cross-peen hammers on one side lets you start small brads without injury to fingers. This traditional cabinetmakers hammer also makes it easy to pound a nail close to a vertical piece or in a tight corner. Carpenter's Hammer Dogyu Brand Carpenter's hammer from Japan is a uniquely balanced quality tool-available in both smooth and waffle face. Give it a try, and you will not want to go back to your old style hammer. Magnetic version will hold a nail in a starting position, and with only one swing the nail is ready to drive home in the usual way! 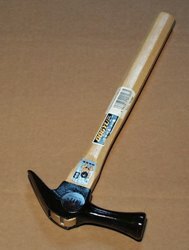 Dogyu Carpenter's Hammer 770-2000 Smooth Face 16 oz. Dogyu Carpenters Hammer Waffle Face 16 oz.